Kate Middleton has become quite the style icon in recent years. Some have compared her to her late mother in law, Princess Diana both in her style and grace as well as her charming demeanor. Of course being a royal she has practically endless money to spend on clothes and brands flocking to have her wearing their designs, BUT Princess Kate chooses to go the more subdued route, choosing classic pieces (and wearing them more than once) so of course she makes a great choice to feature as a budget-friendly style icon! This first Kate Middleton-inspired style is something that would work for lots of different events. The blazer can be added or removed depending on how dressy you want it to be. With the blazer it’s great for work, happy hour with the girls or dinner out. Without the blazer it’s casual enough to wear to the grocery store or carpool lane. My second picks for Kate Middleton is similar to a look she wore that is a bit more dressy without being overly formal. Of course you could always swap the black pumps for a pair of black ballet flats to dress it down a little. Kate has such an effortless, classic style it really makes it easy to replicate her outfits with inexpensive items, some of which you may already have in your own closet! I love the coral skinny jeans in this outfit! And that darling scarf is from Cost Plus World Market. 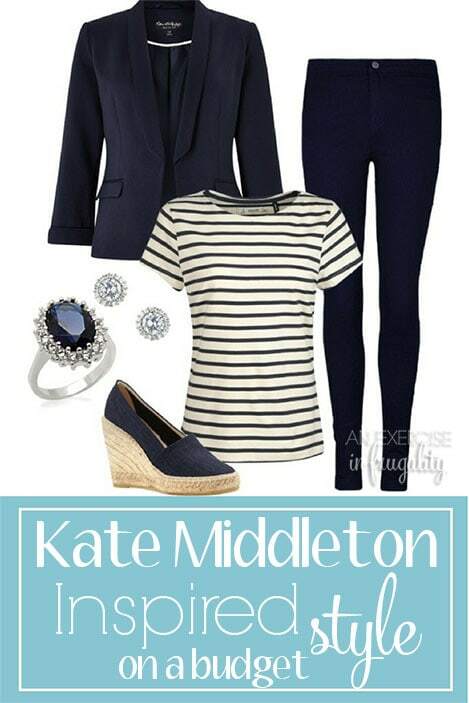 The third Kate Middleton style is more of a formal or party look. The fun polka dot dress has a prim, retro feel to it. Very in style right now, yet still classic! The black and white is perfect for any occasion, and you can add a pop of color with your accessories or shoes, or leave it old school glam like Kate did. This fourth and final Kate Middleton style is another great one for lots of occasions. This look makes me think of fall with the tweed skirt and tights, but could be modified for any cooler days. I love the gray and ice blue combination, and it’s clean and simple lines really make it a classic ensemble in true Kate Middleton style. She really likes to go for these timeless looks, and generally stays away from wild trends. With a little creativity, you could easily put together a Kate Middleton inspired capsule wardrobe using some of these pieces. You may even have many of these in your closet already as some of them are fairly basic fashion staples. It just goes to show you that you don’t have to have a flashy, expensive wardrobe to be a style icon like Kate! For more frugal fashion inspiration be sure to check out the other budget friendly celebrity inspired looks, and be on the look out for new ones coming soon! Also, if you’re reworking your wardrobe, make sure that you include these 10 Classic Wardrobe Essentials Every Woman Needs. 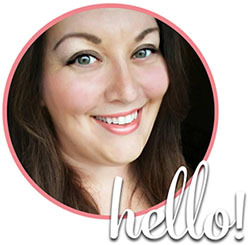 You should also check out my post on when to splurge and when to save on clothes as well as how to wear baby pink and still look like an adult! Who is your favorite celebrity fashion icon? Let me know in the comments and I will try to feature them in a future post!